, showing when and what information is accessible on Google services around the world. We started off by sharing data about the government requests we receive to remove content from our services or for information about our users. Then we began showing traffic patterns to our services, highlighting when they’ve been disrupted. Today we’re expanding the Transparency Report with a new section on copyright. Specifically, we’re disclosing the number of requests we get from copyright owners (and the organizations that represent them) to remove Google Search results because they allegedly link to infringing content. We’re starting with search because we remove more results in response to copyright removal notices than for any other reason. So we’re providing information about who sends us copyright removal notices, how often, on behalf of which copyright owners and for which websites. As policymakers and Internet users around the world consider the pros and cons of different proposals to address the problem of online copyright infringement, we hope this data will contribute to the discussion. For this launch we’re disclosing data dating from July 2011, and moving forward we plan on updating the numbers each day. As you can see from the report, the number of requests has been increasing rapidly. These days it’s not unusual for us to receive more than 250,000 requests each week, which is more than what copyright owners asked us to remove in all of 2009. In the past month alone, we received about 1.2 million requests made on behalf of more than 1,000 copyright owners to remove search results. These requests targeted some 24,000 different websites. Fighting online piracy is very important, and we don’t want our search results to direct people to materials that violate copyright laws. So we’ve always responded to copyright removal requests that meet the standards set out in the Digital Millennium Copyright Act (DMCA). At the same time, we want to be transparent about the process so that users and researchers alike understand what kinds of materials have been removed from our search results and why. To promote that transparency, we have long shared copies of copyright removal requests with Chilling Effects, a nonprofit organization that collects these notices from Internet users and companies. We also include a notice in our search results when items have been removed in response to copyright removal requests. We believe that the time-tested “notice-and-takedown” process for copyright strikes the right balance between the needs of copyright owners, the interests of users, and our efforts to provide a useful Google Search experience. Google continues to put substantial resources into improving and streamlining this process. We already mentioned that we’re processing more copyright removal requests for Search than ever before. And we’re also processing these requests faster than ever before; last week our average turnaround time was less than 11 hours. At the same time, we try to catch erroneous or abusive removal requests. For example, we recently rejected two requests from an organization representing a major entertainment company, asking us to remove a search result that linked to a major newspaper’s review of a TV show. The requests mistakenly claimed copyright violations of the show, even though there was no infringing content. We’ve also seen baseless copyright removal requests being used for anticompetitive purposes, or to remove content unfavorable to a particular person or company from our search results. We try to catch these ourselves, but we also notify webmasters in our Webmaster Tools when pages on their website have been targeted by a copyright removal request, so that they can submit a counter-notice if they believe the removal request was inaccurate. Transparency is a crucial element to making this system work well. We look forward to making more improvements to our Transparency Report—offering copyright owners, Internet users, policymakers and website owners the data they need to see and understand how removal requests from both governments and private parties affect our results in Search. Update December 11, 2012: Starting today, anyone interested in studying the data can download all the data shown for copyright removals in the Transparency Report. We are also providing information about how often we remove search results that link to allegedly infringing material. Specifically, we are disclosing how many URLs we removed for each request and specified website, the overall removal rate for each request and the specific URLs we did not act on. 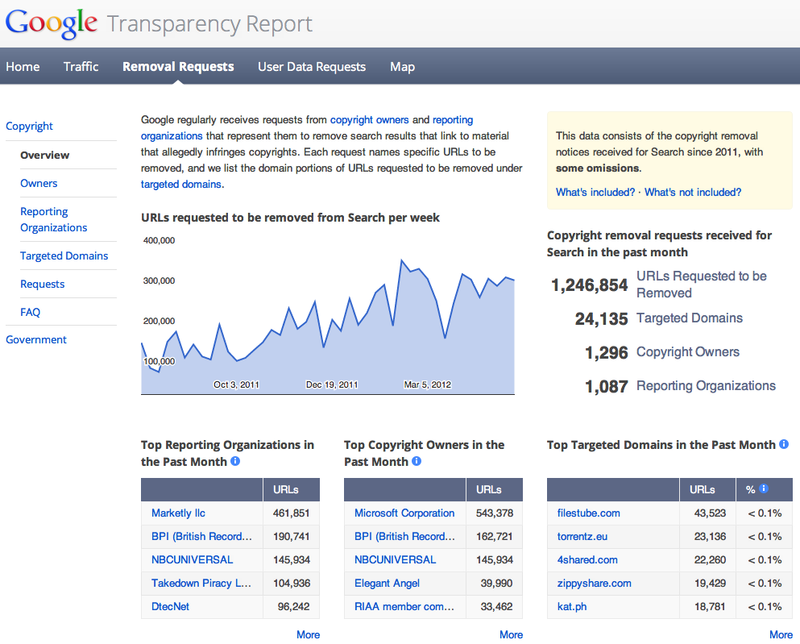 Between December 2011 and November 2012, we removed 97.5% of all URLs specified in copyright removal requests. Read more on Policy by the Numbers. We believe that openness is crucial for the future of the Internet. When something gets in the way of the free flow of information, we believe there should be transparency around what that block might be. So two years ago we launched the Transparency Report, showing when and what information is accessible on Google services around the world. We started off by sharing data about the government requests we receive to remove content from our services or for information about our users. Then we began showing traffic patterns to our services, highlighting when they’ve been disrupted.